Scouts are interesting creatures. I think of three kinds of scouts. First off are the Over Achievers. Probably destined for middle management in corporate America, they organize everything, plan to the minute detail, take their roles seriously, and love directing others. They make great SPLs, PLs, and Scribes. They arrive early to meetings, advance quickly, get lots of awards, and basically have an excellent career in Scouting. What they lack in imagination, they make up for in re-using tried and true successful programs so the troop runs well with these guys running the show. Their attitude is that rules are to be followed and the joy is in efficiency and perfection. The majority of scouts ride the train, tote the bale, pull their share of the load, and generally participate to a required level. They don't make waves. They do the minimum in their positions of responsiblity. They camp with their patrol, do their share of the dishes, learn basic skills, and have a fairly good time. These scouts will probably have decent jobs, families, and fulfilling lives. They are the rank and file upon which others rise. Their attitude is that someone else can figure it out and then they will enjoy the opportunities. Lastly, there are the screwballs, the Bad News Bears of scouting. Scouts that make adult volunteers want to pull out their hair, switch to Girl Scouts, or just move far away. They are the jokesters, the misfits, the rabble-rousers, the hooligans, and they're the ones you never forget. They highly influence all the younger scouts with their antics and their mischief. These are the guys that make or break a troop. Where will they go in life? Who knows! They may just as well wind up as a president or as a life sentence. These are the ones that can best benefit from Scouting and they make outings into adventures. 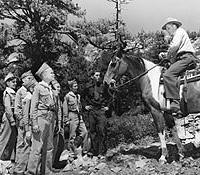 A Scoutmaster that connects with a screwball has a chance for great success. He is often starved for attention and has found a way to get it - right or wrong. Channeling his enthusiasm and imagination down a productive trail is a challenge, but can have rewards for the scout, his patrol, and his troop. Recognizing him whenever he helps, supports, or models behavior well and maintaining calm detachment from his jabs, tricks, and inappropriate behavior can gradually shape his attitude. The screwball's attitude is whatever it takes to get a rise, make an impact, or stir the pot. It's often easier to do that by offending people, but impressing people can have a bigger impact with just a little more effort. Something as simple as challenging this scout might be all it takes. Dare him to teach three scouts the bowline in the silliest way possible. See if he can get the most applause from a song, story, or skit that has a moral at the next campfire. There are many ways to adjust a scout's attitude without breaking his spirit, and maybe without him even knowing. If you're thinking of one or two specific scouts in your troop that might fall into the 'screwball' group, don't forget about all the others. Your troop might benefit even more by coaxing some of your 'by-the-book' guys to lighten up and coaxing some of your 'rank-and-file' guys to try something out of their comfort zone.